First X-Men #1 (Marvel Comics – $3.99) This is on the list because if Batman: Odyssey was any indication, this may end up being the most bat crap insane book of the week. Neal Adams is a legend in the comic industry, and one of his first jobs was on the original run of X-Men, so it’s cool to see him returning to these characters. Adams can still draw the hell out of pretty much anything, and it’s nice to see him getting two high profile books in a row after a fairly long time away from comics. The story is apparently a retcon of sorts featuring a team of mutants that existed before Professor Xavier’s first team. 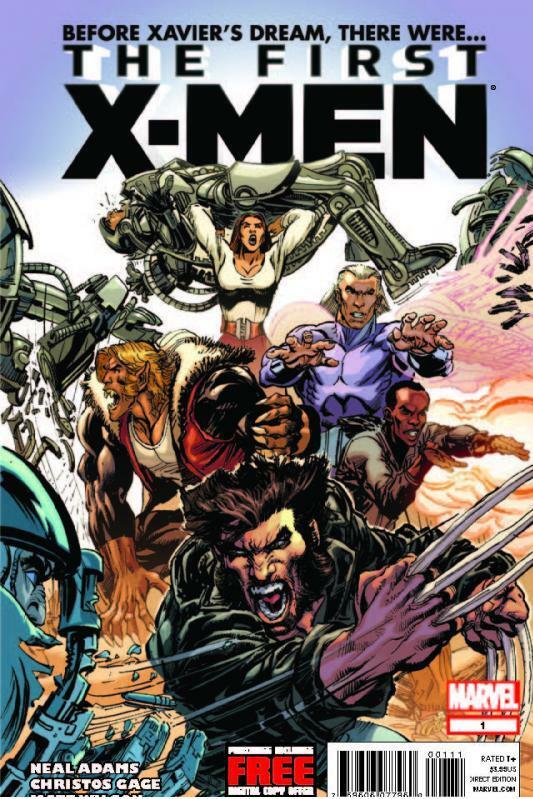 The team includes Wolverine, Magneto, Sabertooth, and a couple of new characters. The series is written by Christos Gage, who is a good writer, and may have reined in some of the crazy quotient found in Odyssey, and that may or may not be a good thing. Now let’s be honest here, Batman: Odyssey made no sense at times, but if you were into that kind of thing, you got a crazy read that was a hoot for a certain audience. I’m not in that audience, but you may be, and more power to you. I can almost guarantee that this book at least deserves a flip through, just to find out what Adams is going to do. Hawkeye #1 (Marvel Comics – $2.99) Here’s another book that I don’t think I’m actually going to pick up, but that I’m sure will have a good core audience. Matt Fraction and David Aja re-team to bring us a new series featuring everyone’s favorite purple clad archer. We know Hawkeye is a big deal in the Marvel U now because he was in a certain blockbuster movie this summer. It remains to be seen if he can carry his own series that readers will actually buy. That said, if Marvel wants the book to succeed, they found a very good creative team in Fraction and Aja. The two created a fan favorite run when they worked on Immortal Iron Fist, and I know fans of that series will be looking for them to recreate that old magic they had together. Hawkeye has never been able to support a series on his own in the past for very long, so it’ll be interesting to see if this new series can gain any traction. Animal Man #12 and Swamp Thing #12 (DC Comics – $2.99 each) If you’ve been reading Jeff Lemiere’s Animal Man and Scott Snyder’s Swamp Thing, (and especially if you’ve read any interviews from either of them in regards to their respective books) you’ll know that both series have been building towards a crossover pretty much since the beginning of the New 52. Well, the crossover is finally upon us as ‘Rotworld’ starts here. A word to the wise, read Animal Man first and then Swamp Thing. Like I said, this is something that we’ve known has been coming for a while, and I think it has been built up to a certain degree, now we just have to see if Lemiere and Snyder can pull it off. If there’s two creators who I think can handle the pressure, it’s those two. Animal Man and Swamp Thing are consistently two of the best series DC is putting out, and I just don’t see them screwing this up. Hopefully the crossover is everything we want it to be.